Tom Vater is a writer and publisher working predominantly in Asia. He is the co-owner of Crime Wave Press, a Hong Kong based English language crime fiction imprint. 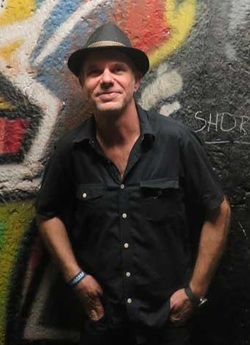 He has published three novels, The Devil’s Road to Kathmandu, published in English and Spanish, and The Cambodian Book of the Dead, published by Crime Wave Press in Asia and worldwide in July 2013 by Exhibit A and The Man with the Golden Mind, also published with Exhibit A in March 2014. Tom is currently writing the third Detective Maier Mystery, The Monsoon Ghost Image. Tom has written for The Wall Street Journal, The Times, The Guardian, Marie Claire, Geographical, Penthouse and other publications. He is The Daily Telegraph‘s Bangkok expert. He has written more than twenty non-fiction books, including the highly acclaimed Sacred Skin with photographer Aroon Thaewchatturat and the more recent Burmese Light with photographer Hans Kemp. In 2014, he published Cambodia: Journey through the Land of the Khmer with long time Lonely Planet photographer Kraig Lieb. Tom is the co-author of several documentary screenplays, most notably The Most Secret Place on Earth, a feature on the CIA’s covert war in 1960s Laos. In his spare time, Tom travels and plays punk rock.